Since I haven’t done many lighting projects in the house, Dad briefly came over with some extra tools (and to drop off sugar cookies… it seems Mom’s in a baking mood). He took the old one down while I assembled the new light, only then realizing that I didn’t take any before photos. Anyway, back to install. 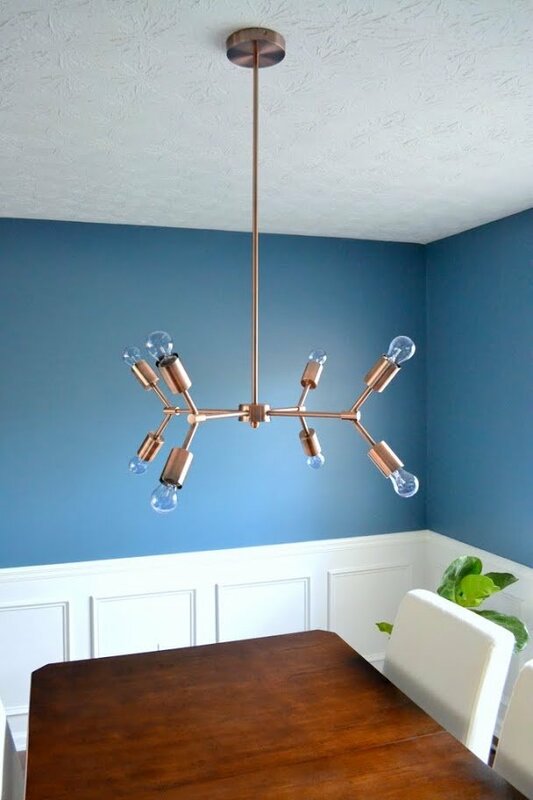 The light fixture is from Urban Outfitters, ordered just a few weeks ago, but it looks like it’s already sold out and/or removed from their site. 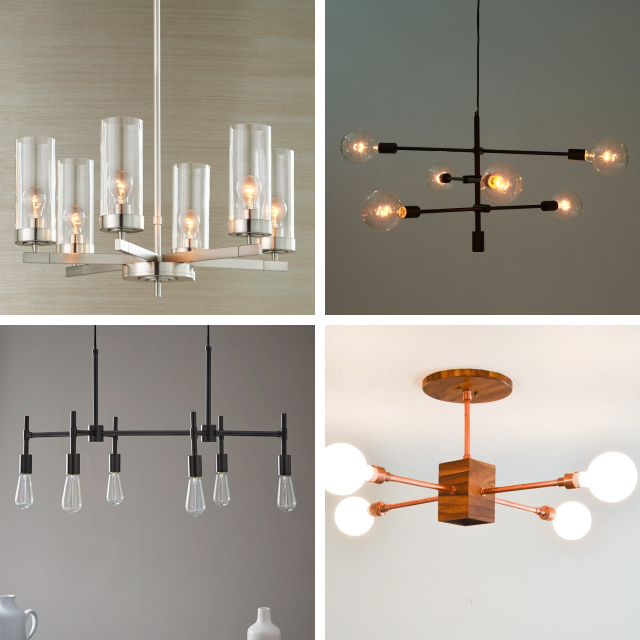 So even though I can’t point you to the exact one, I’ve picked out a few that are similar in style (but note that copper fixtures are usually more of a pendant style). Or, you can DIY a similar one of your own, like Mandi did (#4). The light came with a bunch of extra rods to screw together and several extra feet of wire—I assume in case this fixture was supposed to hang from the top of the Eiffel Tower (I’m exaggerating of course, but not by much). At first, I wasn’t sure how high to hang it, so I turned to my BFF (Google), who promptly informed me that dining room lights need to hang about 30-34″ above the table. The lower arms were right around 34″ with only two and a half rods used, so I clipped off the rest of the excess wire and screwed it together. After I finished installing everything (dropping the teeny tiny screws a couple of times – making me very glad to have a helper to retrieve them), we tested everything out to make sure it worked. At the time, I didn’t have the light bulbs that went with the fixture yet, so I used a single bulb from the old one to check the dimmer switch. It hung somewhat awkwardly from one of the eight arms, which made me chuckle. And this, apparently, is something I take pictures of. Go figure. But no matter. Not his house, right? At least he’s a good sport about it! I really like the contrast of the blue & copper. I think I would have been just as happy with a black fixture (similar to my pick on my dining room mood board), but the thin and modern lines are what I like most. I also like that the copper is more of a brushed finish, which keeps it from looking too red. The most difficult part was finding the right light bulbs. I wanted small-ish and round-ish ones, but most bulbs that are sold in big box stores these days are not all that pretty to look at as a bare bulb (which is what I needed). I also didn’t really feel like trekking to a specialty store or buying online, so I brought home the only two options available: one clear, and one white. Be sure to also check the back of the light bulb’s packaging to find out if it can be hung upside down or not (not all of them are designed to, which can be somewhat limiting if you’re lazy like me). In person, the clear version looks better, but the white ones photograph better at night. Both work nicely on the dimmer, so I’m going with clear and stashing the white bulbs in case I want to change things up in the future (or just need to take a new photograph of the room). Not all the bulbs were screwed in when I tested & photographed, but you get the idea. Clear on the left, white on the right. With the blue walls and the copper light being two of the bolder choices in the room, I’m now leaning toward creating some neutral-inspired art to go along the back wall (originally I was thinking something more brightly colored, but that was before finding this light, and the eye’s gotta rest somewhere). It’s fun to see how the room evolves with each piece added, don’t you think? Happy weekend, everyone! I think it looks great and contrasts nicely with the blue and white room colors. Something similar would look neat in my bedroom! I love the new light fixture and the way the dining room is coming together. I sort of did too, but it seems the higher the wattage, the more cautious you need to be with which direction it hangs. This also seems to be limited (so far) to incandescent bulbs only, but I didn’t check every package in the store. I love it! 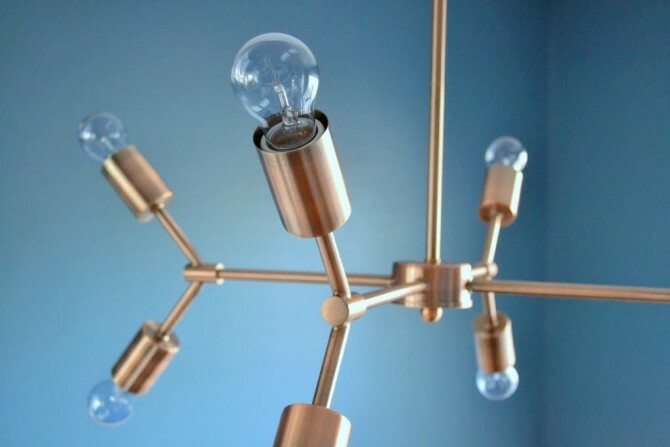 It looks so modern, and the copper color works well with the blue of the walls. Although I guess depending on how big the room is, is the light really intense? I feel like in a very small room it would be a lot of bright light! Actually, the light isn’t intense at all, but that’s also due to the fact that the wattage can’t be really high (that bit I mentioned about the bulbs hanging upside down? It seems that only lower wattage bulbs are approved for that.). Plus, I installed a dimmer switch in the room that helps control the amount of light. 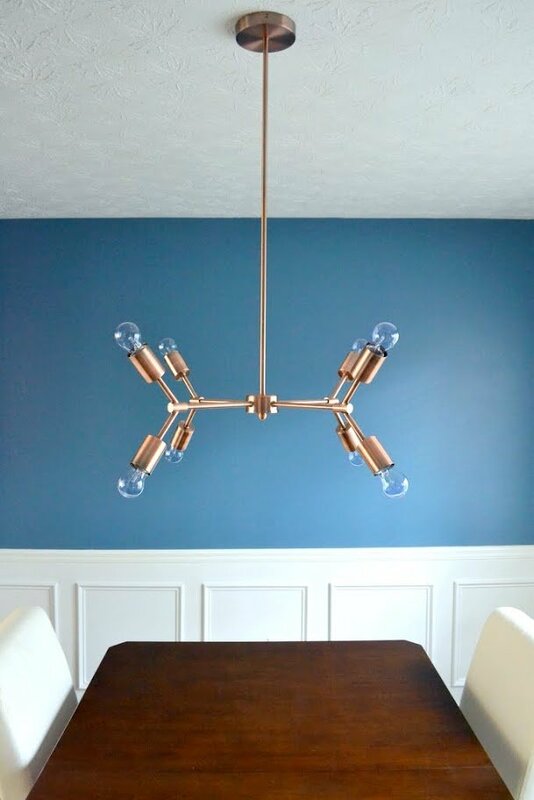 The copper with the blue will definitely POP, over the dining table. Very modern and sparse… The exposed bulbs look great. Love this! Looks like the fixture is back in stock, and I’m planning to order it!! I can’t tell from the UO website what the bulb base is. Did you use a bulb like this, referred to as a medium base (E-26)? Yep, I tried out a few different bulb sizes, but that looks really similar to mine!